Following Agricola's battle at Mons Graupius the surviving clansmen melted away into the hills, and were to remain fiercely resistant and independent. This caused some problems for the invading Romans and when Hadrian became Emperor in 117 AD the Roman Empire had ceased to expand. 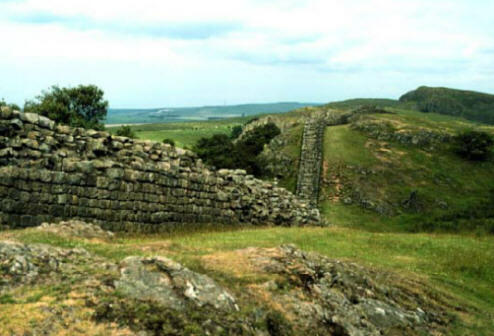 Hadrian was concerned to consolidate his boundaries and after visiting Britain in 122 AD, he ordered a wall to be built between the Solway Firth in the West and the River Tyne in the east "to separate Romans from Barbarians". The original construction of the wall took six years to complete, during which time plans were altered several times. The building was done by members of three auxiliary legions (contrary to popular belief it was NOT slaves) working from east to west. It is also believed that the wall was manned until sometime around 400 A.D.
Life around the wall was surprisingly "normal". Most important of all the structures and groupings of people, clearly, were the military garrrisons along the wall. There were of course the great FORTS, of which there were sixteen, each housing between five hundred and one thousand men. However, small settlements and towns (called Vicus) also grew and these were populated by locals and incomers alike. The Roman incursion into Caledonia, as mentioned earlier, did not stop at Hadrians Wall. Twenty Four years after the wall was ordered to be built, Lollius Urbicus reclaimed an area to the North and this was to mark the new boundary.